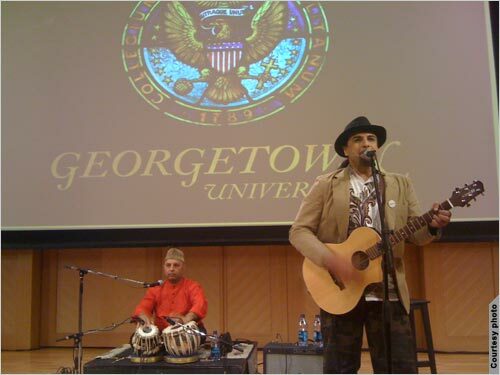 Raga-Rock is a unique blend of Indian classical and rock music, a successful collaboration between Samir Chatterjee from India and Salman Ahmad, a popular Sufi-Rock singer and guitarist, leader of Pakistani band Junoon. Samir and Salman have been collaborating for a number of years. They have performed together in several important venues and occasions around the world, including the 2007 Nobel Peace Prize Ceremony, UN General Assembly, Carter Foundation, Kashmir, Jaipur, Karachi, Spain, Costa Rica and several reputed universities colleges and institutions within the United States such as Cornell University, Yale University, Stanford University, Unversity of Texas, Northwestern University etc.. These two musicians of extraordinary caliber exemplify unity and harmony at a personal level, naturally generating through their music. They are ambassadors of peace. Salman is officially recognized as a UN ambassador. Their musical collaboration is vibrant with positive energy that can attract and stimulate people of all generations and preferences.